It is a credit to the reputation for fine work they have gained that after only two years the Soulpepper Theatre Company should be asked to be part of the du Maurier World Stage Festival. Teamed with Robin Phillips, the director who put Soulpepper on the theatrical map of Toronto in their first season, the company presented the North American première of Helen Edmundson’s adaption of George Eliot’s 1860 novel, “The Mill on the Floss”. After watching what was obviously a meticulously prepared production, I could only wonder how the same team that had made Friedrich Schiller’s 1787 neo-Shakespearean tragedy “Don Carlos” so electrifying two years ago had made this 1994 adaption so utterly boring. My first inclination was to suspect the work itself. I have no great affection for novels adapted into plays. There are so many great plays that go unperformed, I don’t see the point in adaptations that at their best can only remind one of or make one want to read the original work. But there are good and bad adaptations. “Pride and Prejudice” by Christina Calvit at last year’s Stratford Festival, although very popular, gave one the impression of fast-forwarding through the novel in order to play the famous bits at regular speed. Edmundson’s adaption of Eliot is far superior. Her main conceit is to have the central character, Maggie Tulliver, played by three actresses representing her as a child, an adolescent and an adult, and to have these three interact with each other as time passes. This allowed Edmundson to overcome one of the main flaws in adaptations of novels--how to communicate the inner feelings of the main character without resorting to monologue. Edmundson’s dialogue is terse, the action unhurried and the plot sensibly divvied up in two halves, but there are long patches where what the characters have to say, unlike in classic poetic drama, is not inherently interesting. And unlike in Pinter, there is rarely a subtext to make the ordinary seem to mean more than it says. Here, characters usually do say what they mean when they have the chance. Given this kind of text, it falls to the director to give the play life. Although Robin Phillips is one of the few great directors of classical drama in North America, in this case his approach proved to be exactly the opposite of what the play needs. “The Mill on the Floss”, like Edmundson’s subsequent adaptations of novels, was first performed to great acclaim by the British company Shared Experience, a company that specializes in what is known as “physical theatre”. Just last week saw a very potent version of physical theatre at the World Stage when the Maly Theatre of Saint Petersburg performed Lev Dodin’s production of “Gaudeamus”. There spoken text existed only an adjunct to scenes of prop- or movement-based theatricality, not unlike a series of human circus acts that happened to have a narrative through-line. Phillips, however, is justly famous as a text-based director able to coach actors to communicate fine nuances in lines and the complexities in plot. His past successes have been primarily with very “rich” poetic texts, like those of Shakespeare, Molière or Schiller, in productions where unnecessary externals are pared down to only what will highlight the meaning of the text. Edmundson’s text is not “rich”, and Phillips’ normal technique only emphasized this poverty. Thus we saw the fairly ludicrous spectacle of fine actors coached to get every ounce of meaning out of lines in which there was only a dram to begin with. Given the slow, deliberate pace of the action, line after line seemed to fall from the actors’ mouths with a clunk in the funereal silence. The dialogue sounded very much like that of a melodramatic opera libretto but without the music to lift it. Humour, which is clearly there in the remarks of Maggie’s relatives was downplayed as much as possible so that one felt guilty for laughing. While the intent may have been not to undermine the the overall atmosphere of doom, suggested in the mimed prologue to the play, a fuller sense of comedy the first part would have heightened the tragedy in the second. The gloom would have been broken, but so would the deadening monotony. 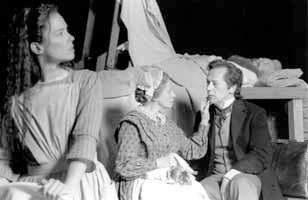 Although the first fourth of the play deals with Maggie and her brother and friends as children, Phillips clearly had directed the actors to avoid any obvious signs that they were playing children. What they were saying contrasted so much with how they looked and what they were doing that one wondered, until their ages were finally announced, if they were supposed to be children or mentally challenged adults. The same was true in the next fourth when the characters were supposed to be adolescents. Only in the second half where all the characters are adults did we seem to be on firm ground, but after intermission is far too late to arouse an audience’s interest in the characters. Phillips’ few attempts at “physical theatre” were heavy handed. How many times did we need to have the entire cast snarl or stare at Maggie to get the point that she is oppressed by society? How subtle is it to show that Maggie is torn between love for her brother and love for the son of the man who ruined their family by having the brother take one of Maggie’s arms the son take the other and start a tug-o’-war? Only the miming of the flood and its effects at the conclusion made any impact. The level of acting was generally high and consistent. All clearly were closely adhering to Phillips’ vision of the play, the only problem being that that vision undermined their effectiveness on stage. Of the three Maggies, Torri Higginson as the child and Julia Arkos as the adolescent were not very strong, Arkos far less interesting than Higginson. As the adult Maggie, Brenda Robins was excellent, communicating both defiance and vulnerability. It is not her fault that the script and direction made it unclear why she should cling to her brother’s authority, despite the rift between them, to reject the two men who love her. As Maggie’s brother Tom, Stephen Ouimette was best as a child and adolescent. The script gives him as an adult little to do but upbraid Maggie for her choice of boyfriends. Neither the script nor the direction suggests any sexual subtext for this behaviour. Tom McCamus as the tutor, Mr. Stelling, was pretty much a blank. However, in his second role as Stephen Guest, Maggie’s best friend’s betrothed who falls in love with Maggie, McCamus was back in form because here, for once, there was a subtext to his character’s words and actions, even if it was the conventional smouldering fire that finally bursts into flames. Steven Sutcliffe as Philip, Maggie’s childhood friend and adolescent sweetheart, was also effective in suggesting long-repressed emotion. As Maggie’s parents, Terence Kelly and Roberta Maxwell were very fine, especially Kelly, who made the gruff but loveable routine as the father seem less clichéd. The direction continually inhibited the humour that could have come out in Maxwell’s character, seemingly as preoccupied with her linen as with her children. In her other role as Lucy, Maggie’s best friend, she had very little of interest to do. Anna Hagan, as Maggie’s prudish Aunt Clegg, could have been the source of much humour if the direction had not smothered it. Jack Wetherall played five smallish parts, though not distinctly enough that I always knew who he was. He made the strongest impression as Bob Jakin, the kindly friend of the Tulliver family, and as Dr. Kenn, the seedy minister. To contrast with the naturalistic acting, John Thompson’s set was completely abstract--a square wooden platform surmounted by a smaller square wooden platform, the whole surrounded by square white walkway. Three black mesh screens descended, often in front of the action. Since there was so little to engage us in the action in the first place, it seemed unnecessarily unkind to try to distance us from it further. Sue LePage’s costumes were very pleasing, cleverly linking the three Maggies with variations on the same blue flock and contrasting her with the other characters all in blacks and muted browns and golds. Louise Guinand’s lighting was very effective in giving a warm glow to the action of the first half to contrast with the cold light of the second. This was, thus, an unlucky debut for Soulpepper at the du Maurier World Stage. The same cast and production team could have shone brightly if only the approach of the director and the requirements of the play had not been so at odds. I have no idea how this choice of play was made especially since both the director and Soulpepper have a love for the classics of world theatre. It's too bad this particular play should mark their first appearance at an international theatre festival. Photo: Torri Higginson, Anna Hagan and Stephen Ouimette. ©2000 Soulpepper Theatre Company.